What better way to spend a hot summer than to surround yourself with the coolest gadgets around? To make your shopping decisions easier, we've done some research and narrowed down your options to a very innovative few -- take a look. One of the last things you feel like doing on a hot summer day is to mow the lawn. 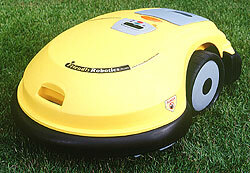 That is why the people from Friendly Robotics came up with the idea of a lawnmower robot. Shaped like a giant ladybug, RoboMow II does the work while you recline in your favorite lounge chair with your favorite liquid refreshment. According to spokesperson from Smarthome.com, Mike Kilroy, this robotic grass-cutter uses an electric motor, so it is pollution free and much quieter than gas-powered mowers. It requires a two-hour, one-time installation of a special border wire around the perimeter of your lawn. A computer-controlled guidance system senses where the wire has been installed and makes sure it only mows the designated lawn area -- up to 2,500 square feet on a single charge. Safety features include six sensors and four touch-sensitive bumpers, allowing it to maneuver around trees and other obstacles. Tilt sensors stop the motor and blades when the ground angle exceeds 20 degrees, eliminating the chance of a runaway mower. The 70-pound robot (42 without the battery pack) costs about $500. While we're on the turf, let's turn to the fairways and greens where you may be spending a lot of time this summer -- more time than you want, if you are a duffer like me. But thanks to Radio Shack, there's help for those of us who need all the help they can get. It comes in a little $19.99 package called the GolfScope. This nifty device is a rangefinder that measures the distance between you and the hole and helps when you need to line up that difficult shot, hopefully not out of the rough. It has a powerful 5 x 20-millimeter scope, is lightweight and only three inches long. A zippered pouch lets you clip this device (#63-980) to your belt. Getting around the golf course and your own backyard lawn may be easier than getting around town, especially when your business or leisure travel takes you to strange places. 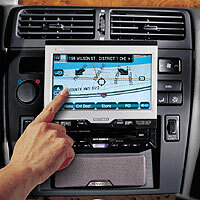 The Kenwood Excelon Navigation System (KNA-DV2100) may be the solution. It's pricey -- $2,199.95 -- but if you are on the road more than you would like, it could be a great value. The Kenwood system is a DVD-based mobile navigation guide with GPS (global positioning system) capabilities, which means you and your vehicle are "being watched" by 24 satellites in orbit around the Earth. It gets its information from these satellites, an internal gyroscope and a connection to the vehicle's speedometer. To navigate, you insert the DVD-ROM map disk of the United States and Canada, enter your destination, then follow the voice and visual directions. You can program the female voice to speak in eight different languages. The GPS system plots your position when you turn on the system. Also, the KNA-DV2100 is controlled by touch-screen operation on a compatible Kenwood monitor or DVD receiver. Unfortunately, no remote control is included. Destination options include cities, streets, intersections, addresses and points of interest (you can save up to 100). You can also program up to five "intermediate destinations" or areas you would like to visit on your way to your final destination. You can also preview an automated simulation of the route before your travel and its built-in trip computer estimates remaining travel time, time of arrival, average speed and elapsed distance. Whether you are at home or on the road, it is safe to say that you are constantly checking your email, either at your desktop, or using your mobile laptop, handheld PC or multipurpose cell phone. To help you sort out the important e-mail from the junk, a new software program from Incline Softworks, eMailBoss, is now available for $39.95. If you have Microsoft Outlook, you'll love this handy accessory that adds the key features Outlook forgot. For instance, a big feature, AutoSort, automatically organizes your messages into seven folders that you can designate into priority levels -- VIP, Hot!, Follow-up, Office Mail, Friends and Family, To Be Reviewed and Occupant. Another feature is Audio Alert. Since you can assign an appropriate sound file to each folder, each time mail is delivered, you will hear the assigned sound -- sirens for Hot!, bells for VIP, etc. With its built-in text-to-speech synthesizer, the program can vocalize the sender's name and subject line of each message. You also can create a "spam blacklist" and by entering keywords, block the email from specific domain names or spamming individuals from even entering your "Inbox". The program can automatically mark certain messages as "junk". If you have more than one email account, eMailBoss can merge your messages and sort out the junk from the important mail by inserting them into the appropriate folders. You can try the program on for size for 30 days at www.emailboss.com. If you remember the days when "executive secretaries" controlled your business life, then you'll appreciate this product. Palm Pilots and the rest of the handheld PDAs -- along with all desktops and notebook PCs for that matter -- will soon be in for some stiff competition from a little upstart company from the San Francisco Bay Area. OQO Inc. recently announced its Ultra-Personal Computer that goes on sale later this year. 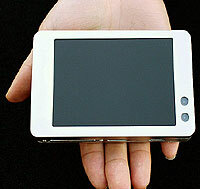 IBM's MetaPad micromini PC won't be ready for a few years. Weighing in at nine ounces and measuring just five by three inches (about the size of a thin paperback novel), this UPC is a full-blown personal computer. Unlike PDAs that merely synchronize information to a larger computer's personal organization software, the UPC actually runs Microsoft Windows XP Professional on a Transmeta Crusoe processor, with up to one gigahertz of power! It also includes 256 megabytes of random access memory (RAM), a 10-gigabyte hard drive and two standard wireless networking connections. A docking cable allows it to connect to an external keyboard, mouse and monitor. It also can be networked to an existing PC or laptop via Ethernet cable or wireless connection. When undocked, the battery holds three to eight hours of computing power, depending on usage. So, if you are thinking of buying a new PDA or PC, you might want to wait a little bit longer. Says Colin Hunter, OQO executive vice president, "Desktops are pretty much dead." On the other hand, the premium price for this tiny PC wizard is high -- about $1000. Here's a toy you can't live without during the summer -- whether at work, on vacation or just hanging out with friends and family -- a digital camera. Toshiba has just introduced the PDR-3310, which they claim to be "so small that it can hide behind your credit card". 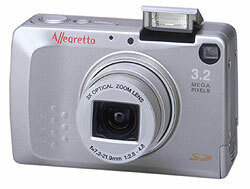 It features the highest resolution for a camera of its size and price on the market today. They may be right. With its three million pixels (2048 x 1537) of resolution, seven shots per 16 MB in super fine mode and a suggested retail price of $499, the PDR-3310 equals or bests the top digital models in every category. Other key features include a 3x optical and 2x digital zoom capability, a lithium-ion rechargeable battery along with super fine, fine, normal and movie modes. This tiny marvel also has a built-in pop-up flash, automatic lens cover, USB connectivity and upgradeable firmware, which means your investment will last through a few future technological improvements. If you want to be photographically "self-contained", you need to take advantage of Toshiba's options for this camera -- 64 MB or 128 MB SD media upgrade cards for increased storage ($99 and $149 respectively) and a USB SD media card reader ($55). From robotic lawnmowers to digital cameras, the possibilities for gadget fun are as endless as a California summer. Surf's up, dude. Copyright © 2002 Les Goldberg All rights reserved.